The GovIntranet theme comes with a number of custom plugins developed for use with the theme. This is just a starting point and you can choose from the many WordPress plugins that are available to integrate into the theme. The British Business Bank has removed the default events functionality that comes as standard with GovIntranet and uses the Events Calendar Pro plugin instead. This gives more of a forward look, birds-eye view and suits having lots of categorised events. Kingston and Sutton councils are moving to Google Apps (as I have happily noticed several government departments doing). They’ll be integrating this with GovIntranet, allowing staff to login once using their work Google account and have their staff directory entry synchronise with their Google profile. New staff members are setup once in Google Apps and they’ll be able to use the intranet ready to go with a new entry in the staff directory, and no separate username and password to remember. Nice! The Department for Business, Innovation and Skills is showcasing the work of the department through “The BIS Story” and we have developed a custom set of templates to highlight the department’s people, teams and achievements. 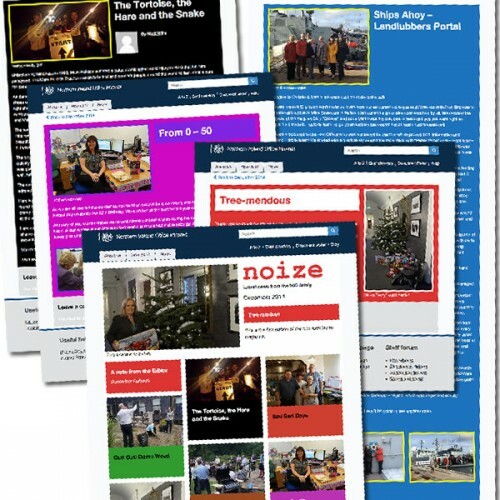 The Northern Ireland Office commissioned a custom set of templates to move their quarterly, typeset, staff magazine onto the intranet. Editors can create a number of engaging page layouts featuring author profiles and photo galleries while encouraging feedback via comments and allowing staff to submit their own stories with photos. This year, in addition to individual client customisations, the core theme has moved on some more. Our most recent clients, the British Business Bank, Sutton Council and the Royal Borough of Kingston Council are all using a new version of the theme, some still in beta. We’re calling it version 4.0 and the theme and templates have been rewritten to remove the Pods plugin in favour of the Advanced Custom Fields plugin to control the metadata associated with the different custom post types. The new version is not publicly available just yet but you can follow progress in more detail over at GovIntranetters.